The town of Bucksport is a centralized area for any travelers who are interested in exploring the Belfast/Rockland area or heading farther east to Bar Harbor. Just 30 minutes from Bangor International Airport, rent a car and drive down and stay at one of our lovely cottages in the area. Whether you are looking for ocean views or pond access we have something that will work just for you! Cappy’s Retreat, Lazy Lane, and Williams Wonder are just a few of our great rentals that are right outside of town. 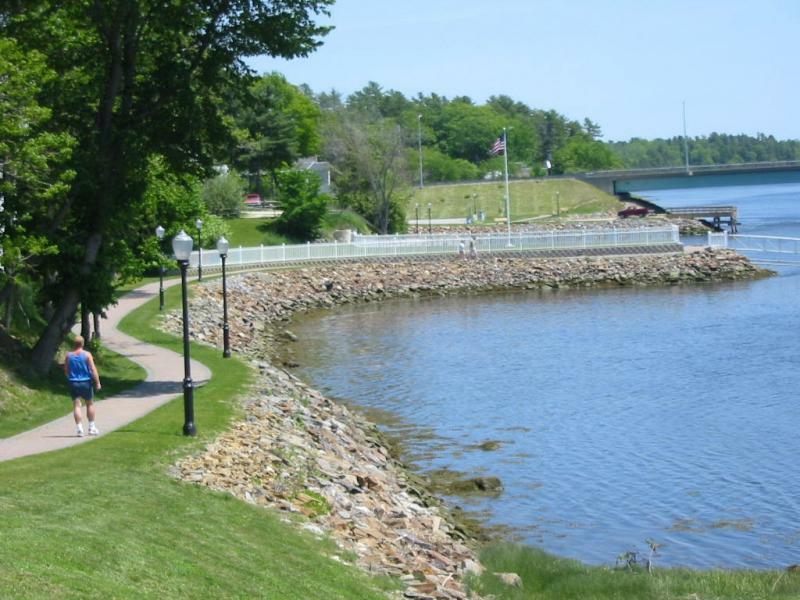 Bucksport waterfront offers a mile long paved walkway that is accessible for everyone. There are many historical plaques along your walk through town. Each plaque describes the history of who and how Bucksport developed into the busy town that it is. As you stroll along you can look across the water and see the Penobscot Narrows Bridge and Fort Knox which are across the Verona Bridge in Prospect. This former mill town got a face lift with the expansion of new store fronts after the closing of the mill. After you get done walking the waterfront go to Wahl’s Dairy Port for their delicious soft serve ice cream or Giffords hard serve ice cream. Their Facebook page has their monthly calendar that shows what the flavor of the day is. One of our favorites is the Peanut butter soft serve. You can’t find any other place around the area that serves this delicious peanut butter flavor! If you go across the Verona Bridge from Bucksport you can make your way across the Penobscot Narrows Bridge to the old Fort Knox military base which also serves as the entrance to the bridge’s observatory tower. Fort Knox is was a military fort built back in 1844 after the British invaded the area of Castine and Bangor through the Penobscot River during the American Revolution and War of 1812. The fort was built in case there were any other invasion from the British. Although it never saw any other invasions or wars at that location, it did provide training grounds for other volunteer troops. The Fort portion is open May 1st to October 31st from 9 am to sunset. If you would like to walk the grounds, that is open year round at your leisure. Check out the old canons and the craftsmanship of all the brick work throughout the entire fort. Penobscot Narrows Bridge was built in 2006, known as the tallest public bridge observatory in the world. It is 420′ above sea level. You may go to the observatory part of the bridge through the entrance of Fort Knox. Take an elevator ride up, and then climb the remaining 3 flights of stairs to the 360 degree panoramic view. There are picnic tables and grills on the Fort Knox grounds where you can have events. There is a covered pavilion. This spot makes a beautiful back drop for any special event. Looking to interact with shop owners with extended hours, check out Wednesdays on Main. Local shops extend their hours so that people have longer opportunities to go in and explore shops. You will see that there are different performers during the week playing music or singing. Every Thursday from 2pm to 5pm their is the local Bucksport Bay Farmer’s Market located near the Bucksport Post Office off of Main Street. The name says it all. This newly opened shop as a variety of options for all of its visitors. Are you looking to shop, but your kids aren’t so keen on waiting around for you? Buy them a snack at their cafe setting and you can shop around in the shop portion of the store while being able to keep an eye on them. You can enter The Local Variety for delicious food, as well as shopping in their store. They provide great cooking necessities, many of which are Eco-friendly. If you are looking to have a small group of people get together for crafting or a birthday they have a room that may hold up to 20 people for your rental needs at a reasonable price. The Local Variety hosts different events in their rental space, sign up for a public or private event. 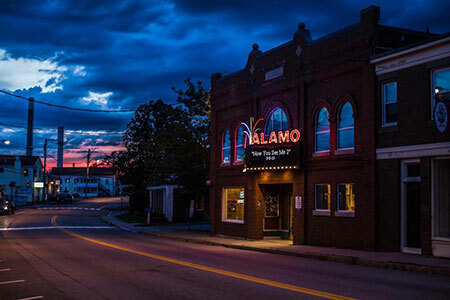 Is one of New England’s oldest standing structures built as a cinema. Northeast Historic Film that owns the cinema works to provide the community of Bucksport with current day weekly films with help of local business sponsors. During the week they run archival films from their own collection at the theatre. Aside from watching films on their digital screens, they provide restoration and preserving services for old films and moving images for clients who want to extend their old memories. If you are looking for more activities that are a short distance away from Bucksport, check out the Bucksport Chamber of Commerce’s website for a lot of fun events, museums and attractions! Their page is a great resource for not only the Bucksport area, but where to go closer to Belfast.